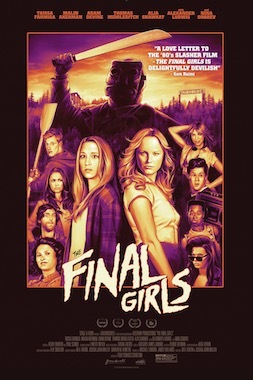 My blog post review of the horror comedy that pays homage to the 80s slasher sub-genre, The Final Girls. I have just watched The Final Girls, a horror comedy that was released on the 9th (12th in the UK) October 2015 on Video on Demand (VOD). A homage to my favourite horror sub-genre the 80s slasher. Unfortunately, I don’t know what the budget was for this film, but as it is a VOD I’m sure it was relatively low. However watching it you do not get that impression, it feels reasonably high budget. The movie won an Audience Award for Feature Film at the Stanley Film Festival and has so far received mostly positive reviews. When Max (Taissa Farmiga) and her friends reluctantly attend an anniversary screening of “Camp Bloodbath”, the infamous ‘80s horror film that starred Max’s late mother (Malin Akerman), they are mysteriously sucked into the silver screen. They soon realize they are trapped inside the cult classic movie and must team up with the fictional and ill-fated camp counsellors, including Max’s mom as the scream queen, to battle the film’s machete-wielding killer. With the body count rising in scene after iconic scene, who will be the final girls left standing and live to escape this film? THE FINAL GIRLS is a genre-blending horror comedy also starring Adam DeVine, Thomas Middleditch, Alia Shawkat with Alexander Ludwig and Nina Dobrev. It features everything you could possibly want from a slasher parody, a Jason rip-off (wearing what looks like a Tiki mask), a camp site and jokes poking a bit of fun at the genre. It does almost feel like actually watching an 80s slasher. I have seen other movies that have either attempted to parody 80s slashers themselves or they have tried to do their own new modern slashers that feel like they are one of the classics, but for me none of them have pulled it off, until now. In the U.S., it has a rating of only a PG-13 (15 in the UK), whereas most true slashers are an 18 (R). But for me this doesn’t really notice too much and in fact sometimes I think having a rating restriction like this can work to a film's advantage, as often I think when a movie can’t have an unlimited amount of blood and gore they try a little harder with other aspects such as the storyline. The Final Girls just works, from the storyline and setting to the cast and high production value. The idea of people from the real world going into a movie is not new and has been done before, but here it is done well, Including the interesting take on having a girl who has lost her mother in the real world connect with, attempt to save and bring back to her world, her mother from the movie. My only real observation is that the final girl in this movie is Max (Taissa Farmiga) and I don’t feel she really looks the part of a slasher’s final girl, but maybe that is just me. Whereas Malin Akerman who plays her mother does look every bit the part, especially as an 80’s scream queen. I can’t recommend this movie enough, it has already become one of my favourite horror comedies, probably second only to The Return of the Living Dead (1985). I do suggest you at least go and rent it on iTunes, and I have my fingers crossed for a sequel.